The following article is reprinted from the September 1967 issue of ALL HANDS Magazine. When most men measure time in days and weeks, Polarismen count in months. Months of training. Months on patrol. Months at home. Their way of life is a mixture of about equal parts education, spaceman-like isolation, family living, adventure, training, and the fellowship of submariners the world over. One way to understand the life of a Polaris submariner is to follow a typical crew of one of the submarines and see what happens during a normal cycle. Each Fleet ballistic missile firing submarine is assigned two full crews. Called “Blue” and “Gold,” each has its own skipper and full complement of officers and enlisted men. While one crew has the ship on patrol, the other is back in the home port, undergoing refresher training, taking leave, breaking in new crewmembers, and, in general, getting ready to go back to sea. 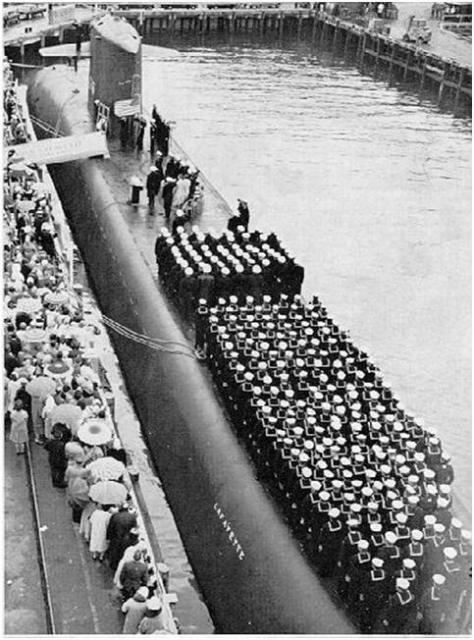 It’s the Gold crew of an FBM submarine homeported in New London, Conn., that is ready to pack up and head out to take their submarine on patrol. There are 124 enlisted men and 12 officers in the crew. The officers include the CO, XO, navigator, engineer and his three assistants, the weapon system officer and his assistant, the communicator, the supply officer and the ship’s doctor. Thirty-four men in five ratings are directly concerned with the Polaris missile weapon system, while another 34 men in four ratings operate the nuclear power plant. These 68 men are ETs, MMs, EMs, ICs, QMs, TMs, FTs, and MTs. The rest of the crew consists of sonarmen, enginemen, radiomen, yeomen, commissarymen, storekeepers, corpsmen and stewards, much the same as can be found in any other type ship in the Navy. The average age of the crew is 24, and almost all of the men are high school graduates or better. Good-byes to families and friends, in this case, are not said dockside but, instead, just before the crew boards buses at New London for an hour ride to NAS Quonset Point. There, a jet passenger plane waits to fly the men to Scotland where their submarine will be returning in a few days. A few hours after takeoff, the plane touches down at Prestwick AFB where the Navymen again board buses for the short trip to Holy Loch, home base of Submarine Squadron 14’s tender. The tender is mother for the 10 subs of the squadron. When the subs come off patrol they pull alongside her for minor repairs, refitting, re-provisioning and the like. By using an overseas anchorage such as this, transit time to patrol areas is cut down for the submarines, adding considerably to their life. Arriving at Holy Loch, members of the Gold crew report aboard the tender to live until their submarine comes in and the change in command has taken place. Then they move aboard the sub, and, with the Blue crew, discuss the problems, plans, needed repairs, replacements and other matters. This alongside time covers about 30 days, after which the Blue crew returns home to New London. Meanwhile, the Gold crew, together with the ship’s force on the sub tender, begins working to get the submarine into shape for its next patrol. A few days before going on patrol, the submarine is taken to sea and tested to insure that she is seaworthy and all her equipment is working as it should. Then, as scheduled, the submarine, complete with new crew, full provisions, and all repairs made, commences her patrol. The crew knows they will be gone for 60 or more days and that they will be submerged for the entire time. Where they are going, what route they will take to get there, just when they will return, only the skipper knows. 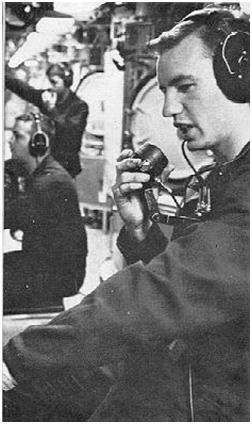 But there is the awareness throughout the crew that the reason for their patrol is to be ready to launch the sub’s cargo of 16 Polaris missiles if, and when, the President so orders. All of the money, all of the time spent in training, all of the effort put into the system is for that sole purpose, to serve as a deterrent to an enemy attack on our country. As soon as the submarine reaches deep water, the crew settles down into the routine of living and working in its inner-sea spaceship. Everyone has already donned the specially designed blue Dacron coveralls which is the uniform on patrol. Designed for comfort, the patrol suit is also a practical wash-and-wear item. Dacron, in addition, eliminates the problem of lint, which could foul the sub’s air. The work routine for the missile system and nuclear power technicians, and the sonarmen and radiomen usually consists of shifts of six hours on and 12 hours off. The yeoman, corpsman, storekeepers, cooks, stewards and others may work normal 10- to 12-hour days or split their work as necessary. To keep some sort of distinction between day and night, the ship is rigged for red at nighttime. All white lighting is replaced by red lighting in berthing spaces and other spaces not requiring daylight conditions. Because the submarine has been assigned a specific area to patrol, within range of assigned targets, the main emphasis of the daily routine is bent toward keeping the missiles in an up status, ready to go. Therefore, missile firing drills are as much a part of life to a Polarisman as are eating and sleeping. In addition to being ready to launch missiles, the submarine has to be ever alert to take evasive action if she detects strange ships, either submarine or surface, in her patrol area. To protect herself, an FBM sub carries torpedoes as defensive weapons. 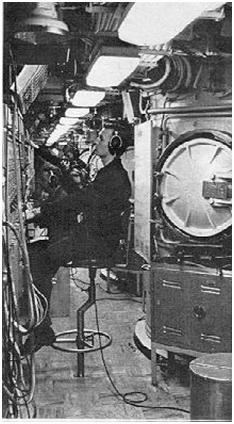 During a patrol, the submarine receives messages regularly, but her radiomen are not allowed to send any since they could give away her position. Daily news broadcasts by the Armed Forces Radio Service are picked up and, considered of equal importance by the crew, so are familygrams. These are brief, personal messages from families and friends of the crewmen which let them know how things are at home. Since the FBM submarine is modern in design, her living spaces are roomier and more pleasing than most non-Polaris type subs. Bunks for the crew, as well as in the comparatively spacious crew’s quarters, are scattered throughout the ship. officers double and triple up in well designed, but compact, state rooms. Only the captain has his own stateroom. The ship is decorated throughout in light pastel colors to provide homey atmosphere. By Submarine standards, the crew’ mess is large. It serves additionally as the movie and recreation hall study area, and the old country star cracker barrel. Eating, of course, is of major concern, and every possible effort is made to provide the crew with out standing food. The effort begins with the ship’s cooks receiving special training at top-flight restaurants before joining a Polaris crew. When the sub left Holy Loch, it was carrying enough food to more than cover the expected duration of the patrol. Boneless and ration-dense foods are used to save storage space but submariners swear by the ability of the cooks to prepare a meal a fresh looking and tasting as anyone can get. Food consumption on a typical patrol will include something like 4000 lbs of beef, 3000 lbs of sugar: 1200 lbs of coffee, 120 lbs of tea 2000 lbs of chicken, 1400 lbs of pork loin, 1000 lbs of ham, 800 lbs of butter, 3400 lbs of flour, and 96 dozen eggs. Some of the more enticing entree listed on the menu are Chicken Isabella, Baked Alaska, Shrimp Newburg, Beef Stroganoff and Lasagna. Standard favorites are roast beef and steak. Four meals are prepared daily – breakfast, lunch, soup-down in mid-afternoon, and dinner – and the galley is open the rest of the time so the crewmen can help themselves (Exercise machines are available to help keep their weight down). 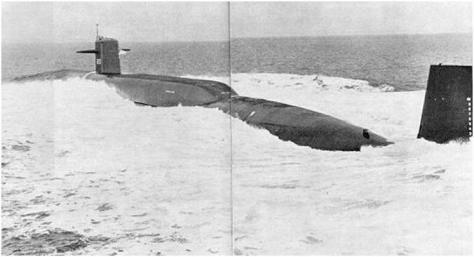 Originally, it was thought that boredom would plague crews of FBM submarines on long patrols, but it has not proven to be problem. This is largely because the long hours and hard work required by all hands on board keep the submarine always ready for its mission. Off-duty hours can be more than filled with recreational or educational activities. For instance, each Polarisman has, the opportunity to take college level courses for self-improvement an college credit. Harvard University has devised a full, two-year course of instruction through which credits toward a bachelor’s degree may be earned. Lectures for the most part are on film and the greatest share of the work is done while the submarine is on patrol. Any lectures, tests, or laboratory work which cannot be completed on patrol is done in the home port as part of the day’s routine. A prime entertainment feature is the evening (or matinee) movie, which often is shown twice daily to take care of both day and night workers. Talent show, game and sing-along nights also help to enliven the crew’s spirit and morale. All in all, the crew usually finds that time passes quicker than expected and soon it is time to head back to Holy Loch and turn the ship over to the Blue crew once again. A few miles out from the tender, the submarine surfaces and the men rejoin the topside world. The first taste of fresh air is not too greatly appreciated, since the controlled air of the submarine is cleaner and purer. And too, a rash of colds may crop up within the crew shortly after their return, for they have been free of such impurities since about a week after submerging on patrol. Once alongside the tender, the Gold crew spends a few days handing the ship over to the Blue crew, and then they reverse the trip they took three months before. After a week or two of getting accustomed to home life again, the Gold crew resumes its regular five-day-a-week program of refresher training. Newcomers will join the crew, and begin their roles as Polarismen, looking forward to the end of the three-month shore tour and the beginning of their first FBM patrol. Such is the life of a Polaris submariner. If not unique, it is certainly different from that of other men, be they sailors, soldiers, air men or civilians.